"Cisco webex: Your Screen sharing system is highly recommended"
Regarding the use of the system of shared screens (Screen sharing), cisco webex is the best that can be achieved. It has an excellent quality of audio and video, and we can review in real time each of the members attached to our meetings, and we can even decide who to add or remove from them. Your free plan has seemed astonishingly complete. We dislike that there can only be up to 7 attendees per meeting. That is quite limiting, and gives the impression of forcing the client to purchase the pro plan. Its meeting spaces tool takes a long time to open, and it is a bit complicated to organize meetings focusing on just one speaker. We did not like the compatibility between cisco webex and the Microsoft outlook platform. Cisco webex is undoubtedly a collaboration service of the most recommended. Your training center system will be very useful to anyone who from the first moment decides to fully explore each communication function offered by the platform. Since we started using the cisco webex service, we have taken a complete turn in the quality of the meetings. Now it is much easier to organize them, and manage each team member within them. Its recording quality has been of great advantage to us, since we no longer have to acquire external software that executes bad quality recordings of each meeting that we have. "Cisco Webex Meeting Review by Dileep"
I like Cisco Webex meeting is because it is very easy to schedule a meeting and communicate with group of peoples. Even you can grant access of your system to another attendee in the meeting and video and audio quality is also good for the meeting. I dislike only one point about the Cisco Webex meeting is when you give the access of your system to other person in the meeting and if he accessing your system that time some part of the screen will become hanged or not accessible. I extremely recommended webex to my friends and colleges where they need to communicate with the number of peoples from different locations over remotely. when i was working on one of the US project that time i need to communicate with them that time i was using webex only for the communication and we are 5-6 peoples from different different locations were easily able to communicate via Cico Webex. "cisco webex is perfect for all kinds of online conferences"
From cisco webex fascinates us its system of use of shared screens, and its tool for private chats, which is excellent when you want to discuss important topics with a specific member of the company. We like the possibility of recording each meeting with high image quality, because this way we can see again and again the points established in each meeting in a comfortable way, and also the recorded files do not consume much space in the memory. We do not like its mobile access, it is slow and not very flexible when it comes to streaming. However, its bidirectional audio and video system does not work properly on mobile devices. We do not like its integration to cisco Collaboration cloud, because it seems to us that it does not offer enough security to our privacy. We also do not like its deployment in Mac desktops, in which installation usually has difficulties. We fully recommend the use of cisco webex. It is excellent to keep coordinated with the other members of the company, and to constantly encourage group work, since everyone can have their turn on screen. We find it extremely convenient to perform Screen sharing. Since we started using cisco webex we have had great advantages, firstly because we can organize each meeting according to folders (which we can also create to our liking). Its online document creation system has also saved us a lot of time, and it is very easy to configure the service preferences. The scheduling system has been useful to organize us. "A smooth conferencing experience all around"
The high quality of the picture and sound are the best things I like about Cisco Webex Meetings. It's also very easy to set up and use since it's mostly based in the cloud. One thing that can always be tricky for any kind of conferencing platform is getting people connected, but Webex makes it super simple with straightforward phone numbers and PINs that just about anyone can figure out how to use. It's also flexible by allowing people to connect online or through a standard phone line. The service is quite good overall. There's nothing I'm too disappointed about in terms of the actual calls. The control panel is kind of hard to read for me sometimes though. The font styles and colors don't really stand out enough on top of the white background. With all of the conferencing platforms out there, Webex is probably not the greatest value for the dollar since it charges per host. If the cost isn't an issue though, I don't think you can find many more capable conferencing systems that are this easy to activate and manage. Cisco Webex Meetings has been a reliable and versatile conferencing platform that has delivered excellent call quality. The screen sharing feature has been smooth and has allowed us to collaborate in a more direct fashion with those in remote location. For organizational purposes, the scheduling feature in Webex has made it easier to set up meetings and keep everyone on the same page about a meeting's start date and time. "Cisco webex is very useful to organize our work"
We like how comfortable working with cisco webex is. It is very easy to keep track of each scheduled meeting, because the audio recordings and the files added to each meeting are separated by an organized folder system. The files that other team members share with you are also separate. Now, your online document creator is excellent. We do not like the little storage capacity in the cloud that cisco webex offers us. This is just 1 gigabyte. We do not like the little customizable that is the system of notifications, because it barely allows us to manage the notifications of the comments in the meetings, or in the files, and the notifications of downloads. This is very limiting, as there are many other things that it does not notify, such as new versions of files from other team members. Cisco webex of a platform of communication of equipment of the most recommended. The fact that it allows us to make private chats, or make shared use of screens, is something excellent. It is recommended to small work teams, with few members. We are quite satisfied with cisco webex. Thanks to the use of cisco Webex we are better organized than ever. Your scheduling system for each meeting is impeccable, and allows us to reprogram them very easily. In addition, cisco webex allows us to record each meeting in excellent HD quality, for later use at work. "Cisco webex will keep you properly connected with your team"
We really like the ease with which we can customize our video conferences, and that we can stream at any time and from anywhere. We really like the ability with which cisco webex can handle audio and video documents in a bidirectional way. It is excellent to perform Screen sharing, since it has an excellent quality of 4K video. Webex is not good for mobile devices. Its mobile application is slow, and offers fewer customization options than the desktop version (an example of this would be the recording of meetings). It does not offer any private chat system, which makes it difficult to encrypt information among members of the work. We do not like that your test period lasts only two weeks unlike many other collaboration platforms. Its price of $ 38 seems expensive. We recommend that all interested parties directly acquire the cisco systems portfolio, since this way the process and the expansion of each work meeting can be covered much more. We highly recommend its use to make stable, inexpensive and unlimited video calls with excellent image quality. Thanks to the use of cisco webex our team is better synchronized than ever. This is because it is easier and cheaper to conduct meetings and Screen sharing. Its integration with Microsoft office has been very useful to work in services such as Word and PowerPoint, to then show the material in meetings. "Cisco Webex, less hassle with meetings on the go"
Webex is more than just a video conferencing system. It extends to be a very interactive experience giving the ability to share screens, raise your hand, chat, view or hide speakers webcam feed. I Like the fact that it even retains some of this interactivity even when you are viewing a replay of a past meeting (using Cisco's Webex player). I like the fact that its available on all platforms and it is easy to install. I like the fact that you can redirect audio to a phone and call in into the meeting if the network is a bit glitchy though I prefer to call in using computer as it is way cheaper. I like the facility that allows you to record a meeting as this is very critical in my situation because it allows me to be part of the meeting if I could not join at the time. I like the fact that you can see if a participant is engaged in the meeting or doing something else. I don't like the fact that it requires a very strong network otherwise it drops out or may just freeze. Also at first the panels in the meeting window may be overwhelming and distracting if you don't know how to hide/show them yet. I recommend Cisco Webex for scenarios where you want to teach as it has all the necessary features that you need to effectively deliver your lecture. In my company we are constantly innovating and receiving capacity building webex meetings on new standards. You will need to download and install a separate application to play meeting recordings as they are in .arf format which is not natively supported by many video players. Cisco webex allowed my company so much mobility as we can hold virtual or join meetings from anywhere in the world! It allows us to share screens and this is vital in my organisation as we are always dealing with statistical reporting with lots of visualisations. Cisco Webex is very easy to use as it doesn't always require any installation. All you need is a browser and internet connection. We have used Cisco Webex to hold meetings within our office location if all our boardrooms are fully booked and we can't convene face to face. Cisco webex's file format is very small but yields impressive audio and video quality. A 2 hour meeting can be compressed into just a 160MB .arf file / video. Webex has a very solid registration and reminder system for any lined up meetings or webinars and it will be difficult to miss a meeting. Timeliness and being organised are critical in my organisation. This is a great tool I use to host client meetings when clients are not available in person. They are very easy to set up and even more simple to log in once it is time to start the meeting. Honestly, I can not say I dislike anything about the webex meetings as they always seem to work just the way I need. My one regret is that I did not use this software sooner because now I use it on a weekly basis. Do not get frustrated at first if you are not able to set up a meeting. Once you know where to click you will be on your way to many successful meetings. Make sure to read the directions carefully on how t add people to your meeting. When adding new people to a meeting make sure you do not select to update the entire group. I have several clients who do not live in the area and are not able to meet in person. With webex we have the capability to not only conference call them but also see them if they have video capabilities. People are very busy and it is very hard to find a good time for everyone to get together and this is a major help because if people only have 15 minutes they can hop right on a call for the time they do have available. "Great program for all types of Business"
I use this program and go to meetings for a long time. This program prove that it stable works and has intuitive interface. "Easy to use, all in one place"
Webex makes meetings simple! Sharing your screen, video conferencing, and audio in one place! I also really enjoy that I can mare readily/easily share meetings and content with others outside my organization. As a member of a sales team, this is critical to business. Additionally, since I'm often on the go, the Webex App makes it easy for me to stay connected ant never miss a meeting! I dislike the loud beeping that indicates someone has joined the call, it can interrupt the meeting flow. I do, hover like to be notified when someone new joins. If you're looking for a conferencing system that allows meeting with both internal and external participants across the globe, Webex is perfect! It integrates the functionality of multiple services into one package. We can conference across the globe with our counterparts in APAC and EMEA quickly and have "face-to-face" interactions via the computer. "solid and good Video conferencing software"
It allows you to connect with people from all over the world at the same time without having to worry about the interruption of the line, the inconvenient dialing process and downtime. It also allows file sharing, which is very useful in videoconferences where documents, presentations and equipment configurations can be viewed quickly and attendees make decisions at the moment. "Cisco webex is our preferred web conferencing software"
We really like that cisco webex manage audio and video files in a bidirectional way, and that allows us to carry out webcasting on demand (which is undoubtedly a great need at present). Something that we love about cisco webex is that it allows us to use the shared screen system, perfect to explain ourselves better to the rest of the team members. Its integrated system for private chats is quite customizable, and we like that. We dislike few things of cisco webex. Among them is the fact that their conference recording system is slow and recordings are often canceled without notice, resulting in loss of information for our small business. It allows streaming of presentations, but this tool is quite obsolete: it does not handle well, it is slow, and it does not show enough audio and video quality. Of rest there are no more things that we dislike. We can recommend cisco webex to all kinds of small and medium businesses, because it offers better performance when you do not have a large number of staff present at meetings. We highly recommend your use of the shared screen system. Cisco webex has helped us greatly to better organize our team, and to hold meetings in short periods of time. An advantage that undoubtedly offers us is the ease to do the conferences at any time we want, irrelevantly of the place where we can find. "Cisco webex offers excellent features for meetings"
This software for meetings and conferences we liked from the first moment of its use. Its application of videoconferencing is very broad, and allows us to stream at all times of them. In addition, it offers us the possibility of recording each conference for later reproduction in a fairly acceptable quality. It is excellent for handling bi-directional audio and video files, and for making use of the shared screen system. We are very disappointed that the mobile application of cisco webex is so slow, especially with the use of shared screens (which in its desktop service are extremely excellent). Its electronic elevation of the hand is quite limiting, and does not offer a private chat so customizable, which makes you want to opt for external platform chats that have more personalization tools. We really liked using cisco webex. Its possibility of recording and later reproduction of conferences is one of its best qualities, and its high video quality make it recommendable to achieve high quality meetings. We highly recommend your access from desktop computers. The truth is that before using cisco webex we had enough problems because the recording quality of our online videoconferences was not the best, and we could not carry out webcast on demand. Cisco webex has helped us greatly to better organize our team, and to keep us communicated with greater ease. "Functional tool with some odd quirks"
I love the fact that most people can join without needing to have a dedicated software pre-installed. Once an invite is mailed, the participant can click on the link and run the executable to launch the meeting. The mute button, and video on/off button are confusing (hard to tell when you're muted and/or sharing video). Also, often times, the meeting will launch twice: one instance will run in the browser and a second instance will start as a standalone program. Until you close out one of the instances, this will cause echo and other audio problem. We are mostly using Cisco Webex to meet outside business partners, vendors etc. who don't have Skype for Business. For the most part, it's working for us but with some quirks as mentioned before. "Cisco Webex offers high quality shared screens"
This web conferencing platform makes it easy to organize our meetings online, no matter how many people we want to add. Webex is stable, and offers excellent audio and video quality. In addition, it offers audio and video in a bidirectional way. The performance of Webex can diminish a little if it is used in devices of low range, reason why we believe that it is not so well optimized. Your real-time chat is very un-customizable, as is your screen sharing. It does not offer a good streaming presentation tool. We have had a lot of problems finding an online conference platform that correctly records video conferences. Luckily Webex is pretty good with this. The lectures are recorded complete, without errors, and reproduced with excellent quality. "Cisco Webex: elegantly organized meetings"
Webex has liked us from the beginning for its ease in taking bidirectional audio and video files, and its screen sharing. It offers us excellent presentation tools, and the ability to record and then reproduce each of our meetings. We do not like it to be so limited for mobile access. Its system of updates of each meeting takes time to synchronize with the devices, and its file view table is quite short. Sometimes it is difficult to update our preferences. We want to recommend Webex to the entire online community. It is the perfect platform to keep track of each meeting, and offers excellent HD quality. In addition, it is optimized depending on the device being used, so that audio and video are the best possible. With Webex it has been made much easier for us to keep our team connected, thanks to its ease of authentication, by which we can log in constantly from different devices. We think it is a very useful platform to make shared screens, because quality is not lost. The pricepoint for a few remote workers has made this a great option for my business for those who live elsewhere or have to work from home sometimes to be able to be a part of our full staff huddles and team meetings while sharing desktops and being able to see one another. The audio seems to cut out sometimes, and we have tried various microphone options for our conference room set up, but have yet to find one that works well all the time for larger group meetings (multiple people taking turns to speak from all around a conference table). Other than that the glitches have gotten much better over the years. This has enabled us to allow employees to move elsewhere and continue to stay on with our team and still be engaged in our team meetings and strength building times together rather than becoming and isolated worker who loses touch with the team relationally and eventually visionarily. "Cisco Webex is ideal for emergency conferences"
We like the speed with which we can create or connect to online conferences with our team, which is ideal for some type of work emergency. We like how well integrated the platform is to the Microsoft Office suite, and that its recording system does not collapse. We are annoyed that Cisco Webex does not offer an adequate integration to note creation platforms (without counting office). It does not offer the highest quality video, and conventional calls are very little configurable. Your application for mobile devices has synchronization problems. It is recommended mainly the use of Webex to work teams with low numbers of staff (up to 7 people, preferably) to stay better organized. We recommend it to record meetings and be able to review them at another time. We had a lot of problems finding a platform that not only performed (not collapsing with the recordings), but also showed audio quality. Webex has solved this for the most part because it is a generally stable service. It is quite efficient. "Simple yet powerful video conferencing "
Ease of accessing website is very good. User Interface is very simple and easy to use. Quality of video as well as audio is great. Single Sign On facility for organizations are a very good feature. same experience in desktop application, mobile application (iOS) and chrome plugin. It seems like quality of meeting recordings are bit low, I have observed some glitches in meeting recordings. Quality of the recordings must be improved because everybody can't attend some important meetings every time. Myself Find difficulty in watching a recorded meeting with noisy audio. Cisco Web Ex is a powerful tool for any organization to help the employees collaborate each other no matter their geographical presence everybody can come under this one platform to connect seamlessly. it provides easy but powerful features that will integrate with existing software such as MS Outlook and SSO (Single Sign On). Mobile application consumes lower bandwidth with high quality images that anybody can attend a meeting even when travelling. Web Ex made easy to connect with people by giving multiple platforms like web and mobile applications to collaborate. Setting up a meeting web ex is very simple with Microsoft Outlook itself, the outlook integration helps us a lot to connect among the colleagues. "The best application to have meetings. " The quality of the videoconference is very good, everything can be clearly seen while the members have semi-modern devices / desks they are using. Cisco offers a lot of flexibility in grouping the services you're looking for, so you're not paying for the inflated software. Although it has grouping options, it is still quite expensive to continue using this software. Only if your team / company / department holds many meetings is when you will find that you are getting the best value for your money. In addition, scheduling a meeting in the future sometimes does not have a contingency option when someone is not available at that time, such as leaving a message or detailed notification that a meeting was missed. It is an easy-to-use software. Easy to set up meetings and share with others. It has functions to share the screen (you can select to share the full screen or a specific program), allow people to make annotations on the screen and share videos. The interface is very modern and many options are available at first glance. You also have the option to perform voice conferencing, so not everyone needs to use a device that has video enabled. The application on mobile devices is also very useful and convenient. "Cisco Webex: conferences with professionalism and good quality"
"An Effective Communication Platform with Higher User Max than Skype"
The best thing about webex so far, has been the higher maximum participants per meeting than skype. It is extremely easy to join a meeting and view content that others are sharing. Furthermore, the ability to turn audio and video on is extremely reliable. The platform is a bit more difficult to understand than skype - which often causes difficulties from more unexperienced computer users. This has delayed our meetings while waiting for individuals to learn how to turn off their microphones. Webex is relatively new to our organization. Therefore, there is often a lot of confusion regarding how to use the platform. Most of our issues come from individuals familiar to skype not knowing how to mute their lines. I would recommend a company-wide educational session for integration. I work in a very large organization that often has meetings for significant numbers of our company. Webex has been the best platform for having large numbers of participants all in one place at the same time. "Efficient Method for Hosting and managing group calls for projects"
WebX is great because users are not required to download a software, increasing accessibility for more callers to be easily apart of conversations, therefore allowing us to efficiently work on more and better projects. There should be more features that identify people (have WebX profiles). There should also be a better chat system that separates the different conversations you are having. Currently, personal, and group wide conversations are all in the same chat box. Furthermore, it is not easy to poll WebEx users in questions for projects which would've been very useful. WebX is great for large audiences and small audiences alike. Having a larger conference audience on our calls. We work with a lot of volunteers, therefore a lot of people need to be kept in the loop about what we are working on - WebEx ensures that people do not run into problems to receive information. "Cisco Webex takes video conferencing to a whole new level"
"Cisco Webex offers a complete and elegant business suite"
"Excellent tool for Video Conferencing"
Webex is excellent for video conferencing during meetings. I like all the features such as screen-sharing, meeting recording as well as knowing who is speaking etc. This is my go-to tool when facilitating meetings with multiple stakeholders. Webex has the best audio and visual quality of any of the video conferencing tools I have used and I have had little issue using this tool over the past few years. I don't like that the meeting ends if the meeting organizer drops the call. This has happened to me on a few occasions both when leading a call and when joining other calls. This is an excellent tool for those looking to facilitate meetings. One note is that those leading a call from their cellphones may find that the call quality might be slightly impacted versus initiating the call from their laptop or desktop computer. Webex provides a great way to connect with other program and project stakeholders at my company. The main benefits I've realized is the high quality of the conference calls I've facilitated and overall usability of the tool.
" Great for meetings and easy to use"
It is pretty easy to use and easy to add on calendar invites. It also has several advantages like In-Meeting Controls, Unified Scheduling, Global Access, etc. I can see who is on the call/who is talking during the meeting. It is very useful to use when co workers are on travel/working from home to attend a meeting. The feature meeting lock is very useful to help prevent unauthorized access to your audio conferences. This is very important for our business environment. Sometimes we have a audio issues for the phone doesn’t connect correctly but that is partly due to conference room we use. Other than that, sometimes we experience a lost of signal from the camera. Otherwise would highly recommend as everything comes with issues especially with technology. Easy to use and would highly recommend especially for meetings that others are in a different location so every can attend. It also has several advantages like In-Meeting Controls, Unified Scheduling, Global Access, etc. I can see who is on the call/who is talking during the meeting. It is very useful to use when co workers are on travel/working from home to attend a meeting. Allows for better communication when some individuals are remotely. There are also multiple audio options by selecting from toll, toll-free, call-back, Audio Broadcast, or integrated VoIP. Webex also has a feature called meeting lock. This helps prevent unauthorized access to your audio conferences as well as your web meetings. It really is a time saver since everyone can join the meeting from their desks. It is not necessary to book a conference room or get into a small office. the use to solve user problems. It really helps us when we can see what they are seeing, and then we can explain what the problem is and how to solve it. Despite all the audio can be a bit delicate. Sometimes, the sound goes down and we have to reconfigure the headphones and microphone. Usually, unplugging it and plugging it in again does the trick. Sometimes we have to leave and go back to the meeting. It is simply excellent for all of our meeting needs, especially when you want current ideas. With this software you must have training, quick meetings, discussions in the large meeting room and dialogues with full functions. It's incredibly easy to share screens between participants. If you have several participants, you can change the screens without delay. The chat window is useful, especially when you need to share links or commands. It is the perfect tool for learning and solving problems. The ease of use, and that we can do so many different types of meetings. It can be 50 people on a call, or it can be 3 people on a call. But the format stays the same and so its really easy to know how to navigate. I also appreciate how it keeps out business together because I cannot travel over an hour just for a meeting. Its easy to use, its easy to figure out, and its nice that they can see im participating in the meeting even though I am not there. I don't like that theres no way to tell people that you have cancelled the meeting except by the outlook event you have created. Sometimes the host is running late or cant make it. I wish there was some way it could go out to all participants. I like when we can see who all is invited/involved so if I need to ask follow up questions I know who I can go to. Great for large companies with many branches to stay connected. I love that it can be recorded so even if I cant make a meeting I can still get caught up with what is important. I also appreciate it is on the phone so we all can mute our phones to keep us not distracted. I like that you can do a phone call or a slideshow. "Do not miss a meeting!" In addition, you can share screens between the members, have a chat, present Slides, share resources, among many others. As for what I do not like Cisco Webex Mettings is the fact that we have to wait a long time to enter a metting verdio of the web version with the extension of Google Chrome. apparently it is not completely configured and usually gives errors and problems. 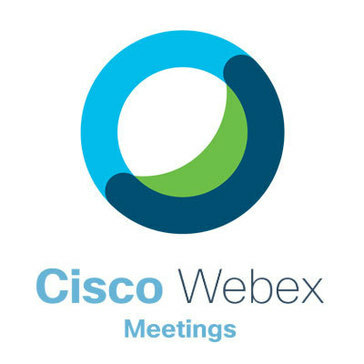 I recommend Cisco Webex Meetings to anyone who wants to save time and money when it comes to meeting, giving support, talking, giving a workshop or class with their clients. Thanks to Cisco Webex Mettings I have been able to give courses, workshops and supports remotely, thus facilitating the time between the company and the clients that in turn helps us to save money and resources of the company. Cisco Webex Meetings is a platform that offers its users the possibility to join or create a virtual room with the objective of two or more people interacting with each other. Also as for the income of the application is super easy because it allows the income with just a click on the invitation Link and entering your name and email so you can be identified in the room. As for the things that I do not like very much about Cisco Webex Meetings, I have to wait a long time to be accepted into the rooms, this usually happens when it takes a long time to get the approval request to the host of the room. I also do not like the visual design very much since I found it very simple and / or minimalist, I know that they could improve it. I recommend Cisco Webex Meetings with all the confidence since today after several years using this platform I have not been bad at the time of entering a meeting. About the benefits that Cisco Webex Meetings has given me is to be able to share information with anyone outside or inside the company, clients or co-workers. In addition to the great savings at the time of time and transportation to hold a meeting. Cisco Webex has reliability and consistency for Webinars. Whether it is phone only or phone and video they continue to lead in the field of keeping you connected to a important meeting when you can be there in person. The transfer screen ability is useful so that multiple people can share their screen based on what is needed during the discussion. It gives the ability to see and comment if you are having the same problem or it yours is something unique and different from the discussed issue. Although I am sure at some point I will find something I do not like about Cisco Webex, I have not found any problems to date. As long as you have connection on your end, the program if effective and consistent. While implementing new software at our facility, this brings people together to see and discuss issues each group is experiencing. It brings together multiple groups of people from around the world effectively. Fast access, flawless functionality. The conference is a breeze with Webex and if you sum to that Webex Teams the experience is complete. The meeting place is the best to collaborate with other people in the distance, record our meetings and review them. The insights are the best now we can get a view of what is happening with the use of Webex, with that we help our IT team to improve the adoption plans. The last downtime in all services impact us and all our clients, I think Cisco needs to get better in that part to avoid those outages in the services. Another thing is the lack of full experience in the web version. The integration with Teams needs to get better too. We need more toll-free services for Colombia, and an easy way to get in the meeting by PSTN phone. I think the support can get better (at least for Colombia), is a little slow. Home working now is easier, we use our Cisco Telepresence endpoints to get a full and more realistic feeling went we have our meetings. Now our field staff can get involved fast in any meeting, solve problems, get in contact with the clients, and help others while they are going to another place. The benefits of Webex are countless went it comes to remote meeting and fast pace collaboration. The hability to meet with anyone without being registered or having an account. It's a very useful tool to avoid going from one location to another just to meet with someone. Sometimes, activating audio is difficult for people without experience with Webex. Usually, the first time a person jon a webex session, he/she has problems activating the meeting audio. Maybe, audio activation is not too intuitive. The adoption process of the tool is key so users really learn how to use it and find it useful. In general terms, Webex is pretty intuitive but you should transmit to users all the capabilities it has and eventual use cases. A good practice (before using the tool) is to identify the user segments in the organization that are going to use the tool, and thus, to identify the different use cases. This could be the base to define an adoption plan that should involve the marketing team of the company. With the help of the marketing team and good trainning material and tools, the tool should be presented to users. Also, it's pretty important to monitor the adoption itself, and use of the tool. It's great to have the hability to meet with anyone, from anywhere, anytime; just with a simple internet access. The main problem Webex solves is to avoid going from one place to another just to meet with someone. I live in a city in which the traffic is so heavy, so avoiding it is key to increase productivity and improve life quality. the senselessness of integration between meetings, team collaboration and in room video conferencing. Its very simple to schedule and join meetings, the new and improved desktop application provides click to join reminders and one click access to personal rooms. The new UI is very slick and has repositioned webex meetings as a video first meetings application. api access from control hub - more access to data from teams and devices via api please. Apart from this i think the product is quite complete. why look anywhere else than the market leader in collaboration? remote working - has enabled us to employ from a wider talent pool using remote collaboration. Meetings rooms are now much cleaner also with no wires or spider phones in the middle of the table. In addition the Webex empowers the user, users are no longer left confused as to how they join a meeting simple controls enable quicker more productive meetings. "Webex - the new way to meet"
Webex is the easiest way to meet with people. Whether video or just an audio conversation, they have finally simplified the process to a single button and everyone can personalize how they join. 4) "@webex" feature in invitations! This is the most amazing feature - simply put @webex in your location field in your calendar app (we use Microsoft 365) and all of the information for the participants to use for joining either via one click on manually is auto-populated in the meeting invite. 5) Webex Teams - simpler to use than Slack and Microsoft Teams. You can host ad hoc calls or video sessions with your contacts, join a Webex and easily follow-up after meetings rather than filling everyone's inbox with more email. Great for continuing the conversation after you finish meeting, regardless of which organization they work for. 6) Webex teams proximity. Even guests can join a video device and make calls or join a call. Truly revolutionary and it makes meeting rooms fun to use again. There is still some overlap and difference between Cisco Webex and Teams. Will be great when this is essentially "one" product and it "just" works anywhere and at anytime. Not enough storage for recorded meetings. Support could be better. It is hard to get support for IOS issues through the Cisco help desk. Which is rare, but does happen when the Webex app and the new IOS update or beta software causes conflicts. Evaluate the power of the desktop app and simplicity of booking meetings when sending an invite. Speed makes it easy to use and then it becomes second nature. 2) Staffing - I am able to retain key personnel because we allow them to live anywhere and we can attract great team members by widening our search since we don't require employees to commute to a physical office. "Webex Meetings For the Win!" Webex Meetings provides an easy to use collaborative interface that allows real time feed back. The integration of video, chat, polling, etc. allow for attendees and audiences to provide input in many ways and allows the meeting leaders to respond quickly to address concerns and questions. It also integrates with our Telepresence systems for full HD video. Cisco is also rapidly improving and evolving the service. New releases are frequent and feature rich. Certain administrative functions take some getting used to and the login is a 2 step process. Lacks seamless SSO option for on-prem users. Definitely do a trial with your partner. It's an excellent solution but you should never go in blind, no matter what you use. Webex allows us to quickly and easily schedule meetings without have to think about reserving rooms or bridges and knowing that it can work for attendees anywhere on the planet. "Fast ,efficient and worthy tool for virtual meetings. " I have been using webex over an year ,it is smooth and easy to operate .When we deal with client overseas and deliver and presentation Webex is the key to success. I rarely faced static over call or disturbances in viewing presentation. It has recording facility which records exceptionally good quality of audio and video. You can chat with participants over the meeting. One of the commendable thing is mobile version , when i am not in office i can join meetings via my cellphone and its easy compatible and secure. Good internet connection is must to have else it may take some time to setup meetings. File sharing option is unavailable. while starting webex it will ask you to install a file to run it ,which sometime causes errors. Great and a reliable tool for video conferencing and screen sharing .You can also take control of participants computer and work on it . Must to go tool with if you do not have price constraint. Working in healthcare industry and while communicating with our clients overseas it is a great help . We conduct and join calls, meetings and presentation with webex and it provides great level of flexibility to join with desktop (by installing a file),joining by browser (doesnt require installing a file) and from mobile. Benefit that make a lot difference for me would be recording facility. "The go-to solution for corporate audio/video bridging!" The way it works smoothly, and with less network bandwidth, every time! I have seen it perform flawlessly each and every time I tried to schedule a meeting with audio and video, tried to share screens, or initiated online polls, or had interactive chats. The collaborative white-board feature is also cool and very useful especially when you are expositing concepts to remote teams and want the idea to get across as fast and effortlessly as possible. They could work on their brand new interface...it takes some time to get used to and most of us spent some time searching for oft-used buttons that changed their familiar positions. They did goof up a little when they rolled out the new interface changes on PC as well as mobile platforms, but I guess they could have handled it a lot better. A detailed and short introductory video explaining the new features would have been very much appreciated. Go for it! It's the best in the field. We have been using this as our default corporate communication solution since 5+ years now and I am perfectly happy with the way it works flawlessly each time we schedule a call, share screens, share media, have chats, and have collaborative discussions. Corporate communications - audio, video bridging, collaboration have become very smooth and effective. This product literally makes tele-commuting and working with remote and disparate teams and team members very much possible and cost-effective! "An excellent option for online meetings"
I do like to be able to meet with those that are not at the place in person. I know there are a lot of options out there and we have a vendor that uses Zoom and they are very similar but I have to say that I much prefer the WebEx. There are not a ton of things that I dislike. I have had the camera pop up and show me when I was not ready for it but I do think that was a setting that I had to change. It is also smart to have something covering your laptop camera if you don't want to be seen from there. I was not on the implementation team but this product seems easy enough to implement. I think the only thing that I would be worried about is training employees to be able to use this tool. If they know how and when to use this tool then they should have all the tools they need to be successful in the ongoing use. Being able to meet with those that are not in the same building. Also being able to host or attend a meeting that has too many people to be able to sit in one room. Some of our meetings are with whole teams within a department which could be up to 50 people. It is extremely helpful to be able to get those people together and share the information consistently and have everyone hear the same questions. "Webex meeting and training "
Ability to communicate with people all around the country. WebEx is excellent for training process when managing a large group of trainees. Its easy to participate to discussions. There is also the possibility to form groups while in the meeting. At RBC we use the platform to do roles playing during the training. The platform will sometimes have so connection issue. Students seems to have a hard time to connect their telephones (audio) to the conversation. Send only one confirmation email with the link to join. Its getting confusing when you have multiple webex in a day. Or make the date more easy to read for us to understand which webex is before the other one. WebEx permits the employees to communicated together without paying any fees and avoiding all the transportation costs. It is a very efficient way to communicate with all the branches in our community. "An excellent tool for connections and business meetings!" WebEs is used by the entire company, each employee is very happy to be able to communicate wherever it is, we use it to make meetings, emergency and scheduled, adding to each one or simply sending an invitation to join. Chats in lines and conversations in real time from any device. From my point of view, I do not find anything that I do not like about WebEx, if sometimes the video call is frozen, but this usually happens due to the internet connection. I would recommend WebEx, for meetings and communication of your company, it is very easy to use and with a good interface, an option for commercial needs. We use WebEx to communicate better while we are in our work or outside of them, calls at distances are in most part one of the best features of WebEx which makes us realize the projects without restrictions and with the opinions and support of our colleagues The solutions have been the proposals and is to hold meetings in a more innovative way. "business meeting with collaboration features"
Webex is the primary meeting software at my workplace. it provides stable remote connection, improved video, and audio quality. It has the capability to share the screen or a specific software or a whiteboard. It is fast to load using browser extensions. Cisco webex enables us to do remote meetings. As a project manager, this tool gives my team flexibility to operate and makes it easy for me to schedule meetings without worrying about reserving a meeting room or having the whole team co-locate. Este software es magnífico para utilizarlo con clientes. Desde nuestra empresa solo utilizamos este software para conectarnos con clientes de fuera de España. Es un sistema muy seguro y fiable. Va más rápido que cualquier otro programa similar. Basta con enviarles a los clienes un link, y se pueden conectar a la reunión sin ningún problema. La versión gratuita es muy potente, pero sin duda capa muchas cosas que solamente con la versión de pago se pueden conseguir. El poder compartir pantalla, el enviar archivos, el chatear...son funciones indispensables para poder realizar una videoconferencia con clientes y no tener ningún problema. La interface es un poco arcaica, siendo necesario dar una pequeña explicación a los usuarios antes de utilizar este software. Personalmente creo que el precio es bastante elevado y esto hace que no muchas empresas lo utilicen. No obstante la calidad se paga, y en este caso este programa es muy bueno, de ahí que el precio no sea competitivo. Otra de los aspectos negativos que reseño es que no existe un manual o unas instrucciones donde indiquen como usar el programa, creo que esto es algo que deberían de mejorar. Todo lo demás es perfecto en un programa que sin duda para nosotros es imprescindible. Lo recomiendo a todas las medianas y grandes empresas que necesiten un programa fiable para poder realizar reuniones en remoto sin necesidad de desplazarse. Calidad, fiabilidad y seguridad son las tres cosas que destaco sobre todo en este producto. El conectar con clientes situados fuera de nuestro país y poder tratar temas muy importantes sin necesidad de desplazarnos in situ es para nosotros una gran ventaja. Además en ocasiones lo utilizamos internamente para conectar con empleados situados en distintas sucursales y poder hacer reuniones comunes. "La mejor herramienta para videoconferencias"
Hace tiempo que uso esta herramienta para realizar videoconferencias con familia, amigos e incluso clientes. Siempre ha funcionado correctamente y nunca he tenido problemas de ningún tipo. La seguridad que ofrece esta herramienta es muy superior a otras con más renombre, incluso he notado que la velocidad de conexión independientemente del tipo de dispositivo desde el que se acceda e incluso el tipo de proveedor que se tenga contratado es muy buena. Destacar la facilidad de uso que tiene para todo, incluso para compartir pantalla, imágenes y cualquier otro tipo de documentación. Lo recomiendo a todas las medianas y grandes empresas que necesiten de una herramienta fiable para poder realizar reuniones en remoto. Seguro que no se arrepentirán de contar con una herramienta magnífica en todos los sentidos. Hemos podido contactar con clientes de una manera fácil y sencilla y gracias a esta aplicación hemos conseguido que nuestros clientes estén contentos y no pongan problemas a la hora de realizar conexiones en remoto. "Innovative to hold meetings without moving to a specific place"
WebEx is revolutionizing the way we work, communicate and hold meetings to know everything without going to a place away from our community, this software has a great capacity to add participants. I can not think of something that is wrong, they have done a good job developing WebEx, creating an innovative and futuristic system for companies with workers like us, with clear goals and without loss of time. Today there are many decentralized companies reaching a greater recognition for their good quality in sales, the way of working is taking a new direction in which we need software as innovative and intuitive as WebEx, with the opportunity to connect for seminars, meetings or conferences. from different devices. In Linio Group we can work from home and still not neglect anything at any time, I have years of experience as a sales promoter, our boss had this brilliant idea so that we can hold meetings no matter where we are. the best video conference application it has all the features for teaching, and managing remote support in case that you need it, easy and fast it is to start or join a meeting from the desktop app. With one click from the Home tab, you can start a meeting in your Personal Room or join someone else’s. was the default leader in virtual meetings. things got markedly better. The tool had broad integration with scheduling tools like Outlook. WebEx is a choice for many companies, When WebEx works, it does so decently at best. It suffers from bandwidth issues, even with only two participants in the same building. Furthermore, if a large enterprise buys an account, they are given "dedicated" support. When the client recently kept crashing every time I joined a meeting, I called the WebEx support number. You can toggle between different screens, sharing content on one view and video on another. And with side-by-side views, you can see your content and meeting attendees simultaneously. Marketing for the business, doing webex teaching our products and all the application that we provide, also doing remote support to our clients. "In our offices we believe that it is best to use WebEx to hold meetings." This software is my favorite, sometimes I'm working outside the offices and we need to meet emergency, so we thought about joining WebEx and it is this application that makes it possible to always stay connected, share ideas and talk about the workflow and clients. Incredible for any small or large company, everything is possible with the right software and WebEx is. Webex is hands down the most reliable meeting platform. It also just upgraded to be more user friendly and I'm a fan. I like that it's easy to log in... the mobile app is incredible... and it's easy to use (and great for when you have meetings with clients that aren't incredibly tech-savvy). I wish the buttons displayed the words or actions they did in the new update. However, all updates take a while to get accustomed to. We host all of our client meetings and internal meetings over Webex. We're a large, international corporation that meets with people we're often now in the same states as, let alone country. It makes it so easy to set up a webex and get to going on the work we're accomplishing.